Color The color of the light emitted. Flare Optional reference to the Flare that will be rendered at the light’s position. Culling Mask Use to selectively exclude groups of objects from being affected by the light; see Layers. You can create a texture that contains an alpha channel and assign it to the Cookie variable of the light. The Cookie will be projected from the light. The Cookie’s alpha mask modulates the light amount, creating light and dark spots on surfaces. They are a great way af adding lots of complexity or atmosphere to a scene. 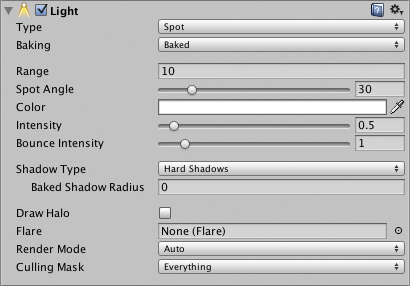 All built-in shaders in Unity seamlessly work with any type of light. However, VertexLit shaders cannot display Cookies or Shadows. Spot lights with cookies can be extremely effective for making light coming in from windows. 저강도 점 광원은 씬에 뎁스 효과를 주는 데 적합합니다. 최상의 성능을 얻으려면 버텍스 릿 셰이더를 사용해야 합니다. 이 셰이더는 버텍스당 조명만 수행하여 저성능 그래픽 카드에서도 높은 성능을 기대할 수 있습니다. Auto lights can cast dynamic shadows over lightmapped objects without adding extra illumination. For this to work the Auto lights must be active when the Lightmap is baked. Otherwise they render as real time lights.